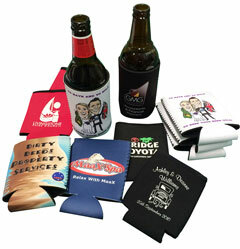 Just thought I would sent you a quick email to thank you for the awesome stubby holders! Not only was I super impressed by the quality but my H2B thought they were fantastic, so kudos to you guys. Fantastic Product, Great Price, Amazing Service! Love it! Most of all so easy to order and quick turn around. Now the trick is to stop H2B handing them out before the day. A big thanks to you Chad and the team. Thank you so much for the stubby holders you did for our wedding, they looked fantastic!!! The guests loved them and they were all taken home from the wedding with many guests asking where they were made. I have passed on your details as I have no hesitation recommending you to all of my friends and family. Stubby holders, a great idea. I just wanted to drop a quick note to say thank you so much for my stubby holders. The website and ordering process was simple to use and your staff were so friendly and lovely to deal with, with very prompt replies and proofs. Thank you so much, they looked fantastic and were a real hit at the wedding. I received the stubbie holders today and I must say they look great. Thank you so much for such excellent service. your a champ they turned out great!